This cold open pivots to an idyllic, happy young couple, Chris and Rose (Daniel Kaluuya and Allison Williams), packing for a weekend at Rose’s parents’ house. This retreat to the woods, however, promises to be far more disconcerting than this quaint introduction. What is immediately established in the film is the tone, set by Michael Abel’s musical score. There are shades of conventional horror swells, but the sonic ambience succeeds nicely in its establishing of both dread and a rhythmic pace. 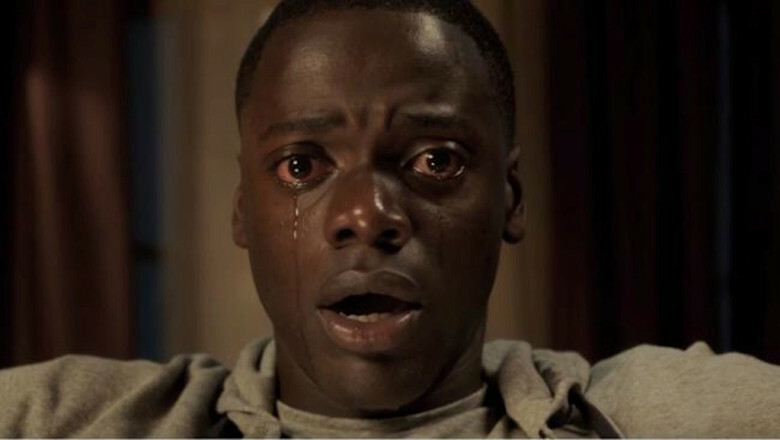 Get Out makes a meal out of its deliberate pace. It moves in inches. Early scares are punctuated by crescendos of non-diegetic noise, but they are set up with an adequate degree of slow-burn tension. Additionally, as the film progresses Peele proves to be adept at both leaning into the cliches of the horror-thriller while simultaneously winking self-aware at their inadequacy. To complement the pace, the film is shot with a careful eye for set design and actor blocking. While the repetition of shots do not attribute to a pattern as much as the film might want it to, the images being dwelt on are just enticing enough to lull you in and then throw you off guard when a quick edit changes the course of a scene. This is the draw of Get Out. The story itself is rather predictable from scene to scene (especially if you have seen the trailer), but the presentation makes every turn compelling. And the slow-burn first half lends itself to the utterly explosive climax. The final 30 minutes of the film is, beat for beat, an uncompromising thrill ride executed with brilliant narrative choices. The social satire of this film is handled quite well. The film is equally cringe-inducing and hilarious, all without taking away from the larger thematic forces at work, themes that distort The Stepford Wives to take on “post-racial America.” Peele is never shy to drag in his established comedic talents, and he chooses where to place this comic relief—literally a relief from the suspense—carefully. Kaluuya leads the charge with this film wonderfully, and his supporting co-stars don’t hurt any either. Catherine Keener, Bradley Whitford, LilRel Howery, and Stanfield all pull together a great ensemble. Williams stumbles a bit, her character shifting over the course of the film in a way that is not fully realized. But the acting, largely, holds up. Get Out is something different. It is something unique which takes the familiar and bends it into a chilling masterpiece of dread. The small kernels that one could cry foul at even come across more self-aware than faux pas. Ironically, the film’s biggest flaw is that it never truly comes across as scary.